"A gripping and suspenseful mystery linking past & present crimes!" Things changing very quickly in the conference room when Gwen Marcey hears the location of the last case to be assigned in their morning briefing at her new job as a forensic artist. Gwen has just started with the Interagency Major Crimes Unit in downtown Missoula, Montana and so she startles everyone when she demands that case and grabs it away from another staff member. The case involves a missing four-year-old child and Gwen drives quickly to the crime scene in the small town of Lawpei, Idaho. On the way, she passes the small town where she had lived as a child and faced an horrific scene. The circumstances are similar, but is that just a coincidence? As she meets up with the handsome Seth Kus, chief of the Nez Perce Tribal Police, and his team, at the crime scene, Gwen knows her intuition is on target. Gwen understands some of the hostility to an outsider; yet, she is surprised as the hostility and jealousy she experiences escalates into vandalism and violence against her. Who is behind these vicious attacks? 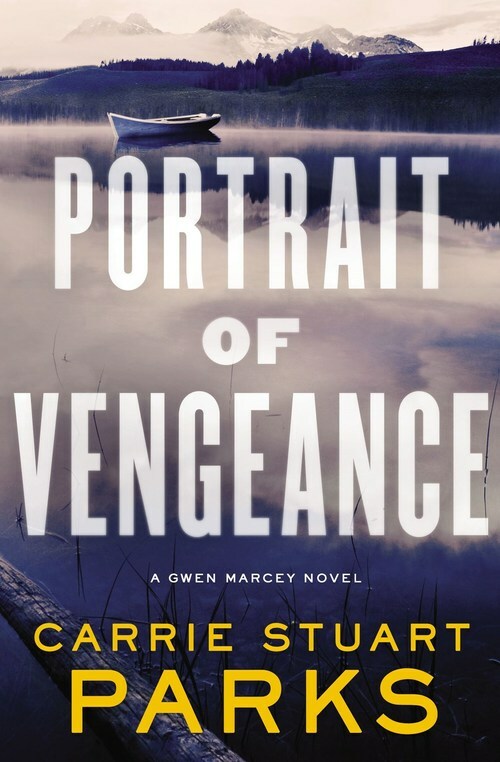 PORTRAIT OF VENGEANCE is the fourth book by the very talented and award-winning author Carrie Stuart Parks. This latest mystery is just as exciting and suspenseful as her previous books, if not even more so. While PORTRAIT OF VENGEANCE is fully complete and can easily be read as a stand-alone mystery, it definitely is much richer as a story if a few of the earlier books have been read before as her many fans will attest. In her work as a forensic artist, Gwen sees crimes from a different perspective than that of other law enforcement officers and this makes her a very intriguing protagonist. She is also a divorced breast cancer survivor with a teenage daughter, so interesting side issues and self-reflections on her actions are multilayered into the plot in a very natural style. Gwen also has a great best friend, Beth, and Winston, her Great Pyrenees dog, both add much to the plot and the story development. Parks is a master storyteller and what I enjoy and admire in her books is how she brings in political and other issues in the story as part of the suspense. In PORTRAIT OF VENGEANCE, she paints a vivid picture of some of the issues facing the Nez Perce (and other First Peoples in the United States) as she highlights past events at Wounded Knee and other historical connections. The intensity of her storyline is also heightened by her use of short chapters and flashbacks to critical incidents in Gwen's own childhood. Fans of Parks ' earlier mysteries are sure to be delighted with this latest addition to the Gwen Marcey series and its stories of revenge. As a totally unbiased fan, I can fully recommend PORTRAIT OF VENGEANCE to anyone who appreciates an amazing crime/police story with intriguing characters and fast-paced action that paints a picture of how past events can have tentacles that find their way into the present. Get your copy and go for a wild ride to find out the mystery behind PORTRAIT OF VENGEANCE! Enjoy! An unsolved case. A tempest of memories. The future�s at stake�and time is running out . . .
Gwen Marcey has done a good job keeping the pain of her past boxed up. But as she investigates the case of a missing child in Lapwai, Idaho, details keep surfacing that are eerily similar to her childhood traumas. She doesn�t believe in coincidences. So what�s going on here? No one knows more about the impact of the past than the Nez Perce people of Lapwai. Gwen finds herself an unwelcome visitor to some, making her investigation even more difficult. The questions keep piling up, but answers are slow in coming�and the clock is ticking for a missing little girl. Meanwhile, Gwen�s ex-husband is threatening to take sole custody of their daughter. As Gwen�s past and present collide, she�s in a desperate race for the truth. Because only truth will ensure she still has a future. Re: A gripping and suspenseful mystery linking past & present crimes!